12 Days of Bullet Giveaways! Happy holidays! Didn’t this year seem to fly by? It’s a good thing it did, too, because the end of the year brings back our annual 12 Days of Bullet Giveaways! Starting December 13, 2014 all the way through Christmas day, we’ll be choosing one winner each day – they’ll win their choice of either a Magic Bullet, NutriBullet, Baby Bullet, or Dessert Bullet! Let us know! Follow the directions below to enter; the more entries, the more chances you have of winning! Awesome post . very well written . THanks for this amazing article. Is there any word on when the winners will receive their prizes? I’ve replied to the email and sent a second inquiry. Since you all seem to have some experience with Magic Bullets, perhaps you can help me: I received three Magic Bullets for Christmas, the Magic Bullet, the Nutribullet (600w), and the Nutribullet Pro (900w). As a newbie to Magic Bulleting, I do not need three. But I am having a hard time deciding which one to keep, unless my decision is based on which two are the easiest to return. I have done some reearch, read the reviews, etc. It would appear that of the three the Magic Bullet has the most trouble. So my choice is narroweed to the other two. Bearing in mind that I am new to this, and may be using it only to make nutritious smoothies, I need some help deciding which one to keep. Help would be appreciated. If I were to win, I would have to go with the nutribullet, since I’ve recently become addicted to green smoothies and would love to see how far one can go with the help of the right blender! I want a nutribullet so bsd I’m trying to lose weight and I know this will help me .I hope I’m the lucky winner. Is Facebook the only way to enter the contest? 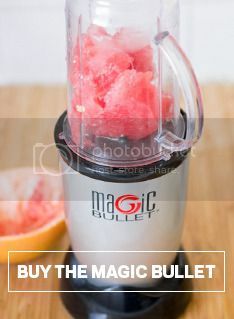 Would love a new Magic Bullet! !